There are lots of times when I think, "Who was the first person who figured out that if you do this and this and this then you can eat the result?" For example, have you ever read the process to get coffee beans you can use to make yourself a drink? It involves picking beans, removing a slimy layer, washing and drying the beans. And that only gets you to the point where you can start roasting them. Who ever came up with all of those steps? Likewise for chocolate. You start with a pod, from which you remove the bean, which has to be dried. Then you can remove the nib, which has to be ground and liquefied to produce chocolate liquor, which is only the starting point for making chocolate we would recognize. Who was the first person to look at that pod and think of working with it for so long to produce a sweet treat? Yeast is another one that interests me, though there isn't actually any documentation to show how it began being used to make bread. Researchers think it probably came about because a mix of flour and water was left longer than usual, which allowed the naturally occurring yeast to begin to grow, which made the bread rise when it was baked. But how did people get from that to the bread we eat today? I remember reading stories about how people heading to the Yukon during the Gold Rush would carry their bread starter in a jar inside their clothes. It had to be kept warm because having that starter meant having the beginnings of food. Whoever it was who first started using yeast, I am grateful to them! I love bread and I love baking different breads. I enjoy watching the yeast as it froths up in a bowl of sweetened water before the other ingredients are added and it has always amazed me how little yeast is needed to make a batch of bread that requires so many cups of flour. When talking with His disciples, "Jesus warned them, 'Watch out! Beware of the yeast of the Pharisees and of Herod.'" (Mark 8:15). The Pharisees had just been arguing with Jesus and "testing him, they demanded that he show them a miraculous sign from heaven to prove his authority" (v. 11). Frustrated with them, Jesus and the disciples left the area and it was when they were alone that Jesus warned the disciples. As I said, it doesn't take much yeast to affect a lot of flour. Likewise, it wouldn't have taken many Pharisees to have affected a lot of common people. They were respected as the religious leaders of the day so the common, less learned people would have accepted the opinions of the Pharisees as being God's own. That would have been fine if the Pharisees were leading according to God's will, but they weren't. In Matthew 23, Jesus actually called them hypocrites, whitewashed tombs and snakes! The Pharisees affected people not only because they were respected, but also because they were vocal. It's hard to ignore people when they're constantly repeating the same message. 'The squeaky wheel gets the oil' after all. And so the Pharisees constantly reminded people of the many regulations they must follow. They were outspoken in their disapproval, even going so far as to rebuke a woman after Jesus healed her on the Sabbath. Never mind that she was set free from the pain she had been living with for years, they were indignant because Jesus had done 'work' on the Sabbath. So what was Jesus warning His disciples about? He was talking about the influence of people who would insist that things must be done their way, but they have stopped looking to God for direction. Beware of people who insist on their own self-serving view of the world and of God, who expect others to rigidly adhere to their rules and who have little or no concern for people. These people still exist today and they still influence those under them, steering people away from God and towards their own interpretation of what God wants. And as much as we are watching those in positions of authority, being certain that those we follow are following God, we also have to be mindful of our own attitudes. Are we following God? 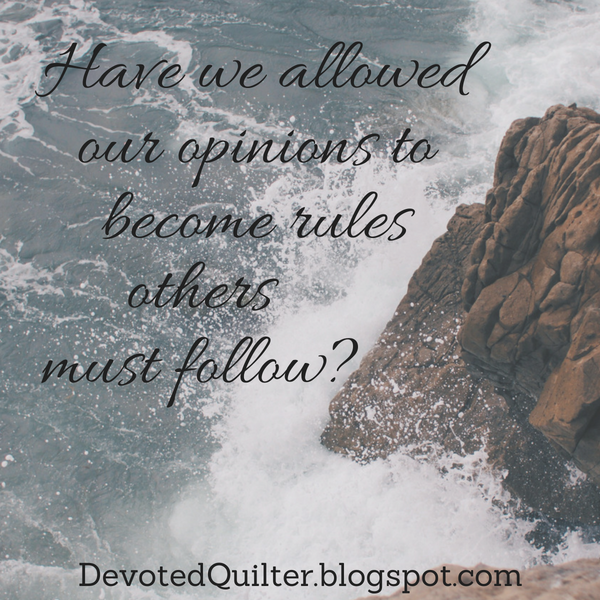 Or have we allowed our opinions to become rules we insist others must follow? The yeast of the Pharisees is a dangerous thing. We don't want to be influenced by it, or to be guilty of becoming it.